The traditional Rolling Rally victory parade took place yesterday, and what a victory parade it was. Almost one million people turned up in person to watch the team roll through by land as well as by sea. But this year’s parade was really special. The team made a special stop at the finish line of the Boston Marathon to commemorate the tragic events that took place on that occasion. 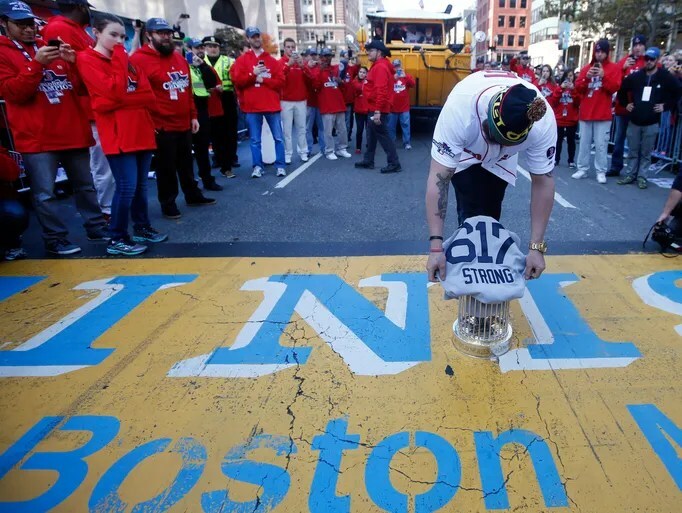 They placed the World Series trophy on the finish line along with a jersey numbered 617 that said “Boston Strong.” Boston Strong indeed. This year’s victory was exactly what the city of Boston needed, and to see the players communing with the city in remembering the Marathon tragedy was just a really beautiful thing. The celebration itself was epic, and it was just awesome. The glory indeed that has returned to Boston this year. The glory, glory, glory that is ours after we won the 2013 World Series. Oh, the glory. What can I say? It was a victory parade. We had a victory parade for a reason. 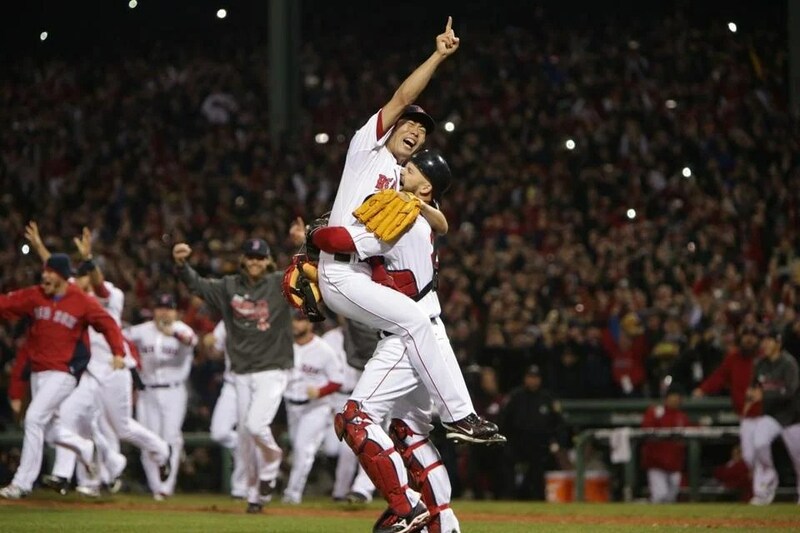 And to see thousands and thousands and thousands of people celebrate that victory really shows what the Red Sox mean to Red Sox Nation. Technically, the offseason officially began as soon as the World Series ended. Now that the Rolling Rally has taken place, attention will turn to things like who will come back next year, who’s talking to who, and who will strike what deal when and for how long and how much. But no matter how much business must be talked this offseason, the epic and awesome and ultimate glory is ours. In other news, the Bruins lost to the Penguins but beat the Ducks and Islanders. First of all, we honored Tek before the game for his fifteen years of service to this ballclub, city, and Nation at the plate, behind the plate, and in the clubhouse. It was awesome. The brass always does a nice job, and Tek of all people really, really deserved it. He got emotional during his speech, but then again, who wouldn’t. Papi gave him two Fenway seats, and Lester, Beckett, and Buchholz gave him the home plate from his last game. He also threw a knuckleball to Wake for the first pitch. It was just a really classy way to honor a really classy guy. We miss you, Tek. And we salute you. If only we could have honored him further with a win. Sadly, it was not to be. Cook did not have a good night in the least. He gave up five runs, only three of them earned, on four hits over six and one-third innings pitched. He walked one and struck out one, and he threw eighty-six pitches. He had fantastic innings in the first and second without incident. He gave up a sac fly with the bases loaded in the third that scored one unearned run thanks to a fielding error by Ciriaco. He again had stellar innings in the fourth and fifth. And then the badness began in the sixth. After securing two quick outs, Cook handed out a free pass on five pitches and then gave up a home run. And then he gave up a solo shot to lead off the seventh. After a groundout and another fielding error, this one by Middlebrooks, which put a man on base, Cook was replaced by Morales, who secured the second out and dished out a walk before he was replaced by Albers. Albers gave up a single that scored two, both of which were scored by inherited runners, one from Cook and the other from Morales. So there are those who say that two pitches caused Cook’s downfall last night. I would beg to differ; clearly a home run could account for one run only, and it’s not like Cook gave up only two runs, both of which happened to be homers, in which case you could claim that he only made two mistakes. That’s not what happened. Cook gave up three earned runs and two unearned runs, and it wasn’t only because he gave up two home runs. Of course, the issue of how to interpret the unearned runs is always interesting, but ultimately you have to hope that the starter is positioning the team so well that a couple of unearned runs won’t hurt it. The pitcher can’t control what errors the fielders make, but he can largely control whether runners are on base and therefore score on those errors. And those runners would have had to be there before the error, so in that sense the pitcher is responsible. Then again, you have to expect the fielders to field correctly. So it’s an interesting question. Since errors are so unpredictable and can’t necessarily be helped, I’m going to say that Cook should have been able to do more to ensure that those errors didn’t cause runs to score. So in that sense, two pitches didn’t cause Cook’s downfall. There were many other pitches he threw before those two that had a hand in the loss, even if he did only give up three earned runs. Some of those other pitches were thrown by the Jays, because clearly we didn’t do much with them, and that didn’t help things. Salty hit a mammoth three-run shot in the second that was totally awesome. Gonzalez singled, Ross doubled, and Salty fouled off a slider and a fastball and took a slider for a ball before getting something down and in that he knew he would hit and unleashing on that one. He sent that into the bullpen. Padilla pitched the eighth, and Tazawa came on for the ninth. He allowed a double, a sac bunt that moved the runner to third, and then a run on a fielder’s choice. The final score was 7-3. Only two of our five hits were for extra bases, and those five hits were distributed among five of our starting nine. So there were no multi-hit games and there were not enough hit games. We even walked only twice. So here’s the kicker. At the time, Salty’s home run gave us a three-run lead. So all these questions of how you look at the unearned runs and how many pitches caused Cook’s downfall don’t have any impact on the fact that let a three-run lead slip through his fingers. Admittedly, the offense should have done more. But so should have Cook to preserve that lead. And that’s why it was crushing, because philosophy aside, we had a lead and then we lost it, and at that point there’s really not much explaining to do. Well, we’ve made it through the first half, but I can’t say I’m pleased with where we are. The only thing I could say is that I’m glad it’s not worse than it is, but that really, really doesn’t say much. We’re suffering from inconsistency, injuries, and just a general lack of that spark we’ve tended to see in our winning teams in recent years. These are underlying, pervasive problems that can’t just be fixed by a trade or a snap of the fingers. Changes have to come from within, but it’s hard to pinpoint a solution when the sources of the problems are hard to pinpoint themselves. Either way, we know what we have to do to improve: win consistently. As backup catchers go, Shoppach is pretty good. In thirty-one games, he’s made only two errors and four passed balls. His catcher’s ERA is 3.76, which anyone on our pitching staff these days would be lucky to have. He has also hit ten doubles and four home runs, and his batting average is .269, which isn’t bad for a backup catcher, either. Salty is working out much better than we expected power-wise. He ranks first among all Major League catchers in home runs with seventeen, which I don’t think is something many people predicted. But all but one of those were hit from the left side, which is something he needs to work on. He also needs to work on his fielding, which is supposed to be one of a catcher’s strong suits. His fielding percentage is .987, which is high but, in my opinion, not high enough. He’s made six errors and passed five balls; I’m looking for something closer to zero errors and zero passed balls. His catcher’s ERA is 4.45, which is decent, and he’s come a long way as far as forging relationships with the pitchers and calling good games is concerned. I am not afraid to say that Gonzalez so far has been a huge disappointment. He is nowhere near the powerhouse he was last season, and I was fully expecting this season to exceed last season. He is second among Major League first basemen in doubles with twenty-seven and eighth in RBIs with forty-five, but he’s not even in the top twenty in home runs. With only six, he’s actually last among all first basemen in the American League. His fielding, however, is as solid as ever. He’s made only one error, so his fielding percentage is .999. But offensively we need much, much more from him. The team is struggling, but he was not supposed to be one of the reasons why. It’s always tough to grade a player who’s been plagued with injuries because you have to assume that the injuries weren’t his fault, and you have to try to compare his performance given the injuries with what you expect his ideal performance to be given the injuries. The truth is that Pedroia is struggling across the board offensively. Doubles, home runs, walks, on-base percentage; you name it, he’s not performing as well as he could be in it, even given the injuries. His fielding, like Gonzalez, is as solid as ever with a percentage of .997. But like Gonzalez, Pedroia was not supposed to be one of the reasons why the team is struggling. He’s a phenomenal leader both on and off the field, but we also need him to lead the charge offensively and help the team win on a more consistent basis. Our woes at shortstop for the most part continue. Why we can’t get a shortstop in there who can hit as well as he fields is completely beyond me. Aviles is making a valiant effort, but it’s not enough. First of all, his fielding percentage is .982. He has made seven errors. I understand that shortstop is the most difficult position defensively, but that’s also why you need an amazing fielder to man it. Aviles is a great fielder. He is not an amazing fielder. He’s not an amazing hitter, either. He has a .260 average and .283 on-base percentage. He’s hit twenty-two doubles, no triples, and nine home runs with forty-four RBIs and twelve walks. Not the best shortstop material. Middlebrooks has some big shoes to fill, so he has to go through a process of proving himself. I will say that he’s off to a fantastic start offensively. His performance at the plate has been phenomenal, and it’s been truly wonderful to witness the fruits of our labor on the farm in growing a power hitter ourselves. In forty-eight games, he has fifty-one hits, eleven of which are doubles and ten of which are home runs. He has a .298 average and a .335 on-base percentage thanks to nine walks, so he could walk more. His performance in the field, not so much. He has a fielding percentage of .935 and has made seven errors. Third base is a tough place to play as well, and he needs to work on it to round out his game. Think about what Punto is for. Punto is a utility infielder. He’s supposed to be able to play any position decently well and to hit decently well. He is not supposed to be truly outstanding at everything infield, and we’re lucky if he’s outstanding at one thing infield. So the criteria he’d have to meet for an A is lower than it is for a starter. Still, as utility infielders go, it’s not like he’s been that great. His average is .212; only six of his twenty-one hits were for extra bases, and he has only eight RBIs. And he’s played forty-nine games, which is about more than a quarter of the whole season, so it’s not like he’s had hardly any playing time. His performance in the field is much stronger than his performance at the plate, but it still could be better. I was on the fence about a C or a D. But then I realized that I was only going to give him a D because Josh Reddick would have been so much better, and that wouldn’t be fair. It’s not Sweeney’s fault that he’s in right field and not Reddick; that’s Ben’s fault, and we’ll get to that later. Anyway, Sweeney’s .283 average is respectable. His seventeen doubles, two triples, and zero home runs are not. Neither are his nine walks. His two errors in right are alright, but errors made in the outfield tend to be costly because the ball is farther away from the infield, so those two errors could probably count for more. Ross has been good but not great. His thirteen home runs from the right side of the plate are a much-needed edition to our lineup, and his twenty-four walks show patience at the plate. He also has fourteen doubles and forty RBIs to his credit, and he has yet to make an error in the field. I’d say he’s been better than expected, but he could be better still; his .264 average and .345 on-base percentage leave much to be desired. If you told me during Spring Training that Nava would play fifty-two games by the All-Star break and bat.275 with an on-base percentage of .388, I would have been extremely skeptical. But that’s what happened. And he has forty-seven hits to his credit, seventeen of which are doubles and three of which are homers. He has also walked twenty-six times and has made only one error. For a utility outfielder that has suddenly found himself in the limelight thanks to injuries, he’s been handling himself very well. In short, he’s still a kid and he needs work, in the sense that he needs to be worked, in terms of playing time, and to be worked on, in terms of training time. He’s played eighteen games this year and has hit only two extra-base hits, both of them doubles. He has walked only twice and batted in only five runs. And he has made two errors, and between the fact that that’s over the course of only eighteen games and the fact that outfield errors are costly, that’s a lot. Nobody on this team deserves an A more than Big Papi. He ranks tenth in the Majors in doubles with twenty-five, fifth in slugging percentage with .607, and is tied for seventh in homers with twenty-two. Among DHs, he ranks first, first, and third in those categories. Simply put, the man’s job is to hit for extra bases. That’s what he does. He’s been doing it from day one this year, and he has continued to do it consistently. He’s just hit the four hundredth home run of his career, and he looks like he’s in line to hit many, many more. This season, the team seems to have two constants: inconsistency and Big Papi. As a team, we are sixth in the Majors in average with .268, eighth in on-base percentage with .329, and fourth in slugging percentage with .441. We are second in runs with 432, third in hits with 302, first in doubles with 208, eighth in home runs with 99, and third with RBIs with 409. And yet somehow we fail to win consistently. It’s because we don’t score runs consistently. Sometimes we score a little, and sometimes we score a lot. And of course it also has to do with the pitching, which we’ll get to later. But like I always say, just like the pitching staff’s job is to make sure that we win regardless of what the offense does or doesn’t do, so it is the offense’s job to make sure we win regardless of what the pitching staff does or doesn’t do. We are sixth in the Majors in fielding with a percentage of .986. It could be much, much better. I guess we can chalk it up to several players in key defensive positions having had to get used to Fenway, but that shouldn’t have taken the entire first half of the season. Lester has not pitched well at all. In fact, his numbers are unfortunately similar to Beckett’s. Why must our aces struggle at the same time? Why must our aces struggle at all? These are some of the big questions for which the team does not seem to have any answers whatsoever. He has a 4.49 ERA and a 1.35 WHIP. In eighteen starts, he is 5-6 with fifty-six earned runs, thirty walks, and eleven home runs. Those numbers put him in the basement of the American League, which is not where a pitcher like Lester is expected to be. Like Lester, Beckett has not pitched well at all. In fact, his numbers are unfortunately similar to Lester’s. He has a 4.43 ERA and a 1.20 WHIP. In fourteen starts, he is 4-7 with forty-four earned runs, twenty-two walks, and nine home runs. He also has the lowest average strikeout total per nine innings of his career at 6.5. And this is the mighty Josh Beckett that should have won the Cy Young in 2007? He’s like a completely different pitcher now. Buchholz has actually been terrible this year. He has started fourteen games and is eight and two, but he has a 5.53 ERA and a 1.54 WHIP with fifty-three earned runs, fifteen home runs, and thirty-four walks. In 86.1 innings pitched, he has given up ninety-nine hits. It’s a miracle that he has more wins than losses, and how he managed to rack up so many wins is a mystery. Yet another disappointment. I’m honestly sorry to give Bard a D, but it’s the grade he deserves. He was made a starter partly because his superiors wanted him to be a starter and partly also because he wanted to be a starter. But the truth of the matter is that he has no business being a starter. If something isn’t broken, nobody should try to fix it, and Bard was on the road to a fantastic career as a closer. We needed him as a closer. And instead he became this mediocre pitcher stripped of his dignity. He started ten games and had an ERA of 5.24 and a WHIP of 1.62. In fifty-five innings pitched, he gave up fifty-two hits, thirty-two earned runs, six homers, and thirty-seven walks. His record was 5-6. Let it be stated here that Bard is much more effective as a setup man or closer. And the fact that that actually has to be stated is an embarrassment. It should have been evident. I don’t think anyone predicted in Spring Training that Doubront would become our best starter. Then again, as we have seen, this season has been full of surprises, most of them unpleasant, so Doubront was a breath of fresh air. Not that that says much. In any other season, if Lester and Beckett and Buchholz pitched to their abilities, Doubront would be at the middle or bottom of the rotation at best. Anyway, his ERA is currently 4.41, and his WHIP is 1.38. He has started seventeen games and has a record of 9-4. In ninety-six innings pitched, he’s given up forty-seven earned runs, fifteen homers, and thirty-five walks. Compared to how we thought he was going to work out, Cook was actually a pleasant surprise as well. Again, that doesn’t say much, but given his health when he joined the team, it does say a lot about his determination and commitment. Plus he pitched that absolute gem a few starts ago, which can not be overlooked, especially since he’s made only four starts this season so far. He has a 4.37 ERA and a 1.19 WHIP, which is decent under his circumstances. And we need the extra starter anyway. I’ve been thinking that Dice-K is a problem with no solution. Albers has not been outstanding, but he has been pretty great. He certainly has made a valiant effort to turn it around from last season and has a nice 2.38 ERA with a 1.09 WHIP. In thirty-four innings, he’s given up thirteen runs on twenty-six hits with twenty strikeouts. He’s pitched in thirty-two games and has blown only three saves. It should be zero, but this is not the team with which to be picky. Again, not outstanding but pretty great. 2.75 ERA and 1.02 WHIP in 19.2 innings pitched. Six runs on thirteen hits and no blown saves. If he continues pitching as well as he has so far, he will have the best season of his career numbers-wise. Granted, he spent most of his career as a starter, but he’s found this new role in which he has a chance to be really successful for a team that really needs him. Here’s someone who’s outstanding. Atchison is probably our best reliever so far. His ERA is a low 1.79, and his WHIP is a low .99, and that’s over 45.1 innings pitched. He’s given up only nine runs on thirty-six hits while walking nine and striking out thirty-three. He has also given up only two home runs. Outstanding. As a setup man, he hasn’t done as well as I would have liked. His 3.94 ERA and 1.38 WHIP are actually terrible for a setup man, but somehow he gets through it. In thirty-two innings, he’s given up fourteen earned runs on thirty-five hits while striking out only nine. He’s blown two saves. Now, a setup man is a setup man; he’s supposed to put the closer in a position where the closer can close, and he’s supposed to keep the team in a position where the team can win. That means not blowing any saves and not giving up any runs, and if you do give up runs, giving up the bare minimum of runs. I don’t feel he’s done that. Another thing that I don’t think anyone predicted at Spring Training was Morales’s versatility. He is both a reliever and a starter, and he is effective in both roles. He is 1-2 with eight holds and no blown saves, and he has an ERA of 3.50 and a WHIP of 1.17. He has made four starts and pitched 46.1 innings total, and he has given up eighteen earned runs on forty-one hits while walking thirteen. Between all the injuries we’ve had, without Morales to fill in and start, we’d be in a very bad place. Melancon doesn’t do much. Somehow it’s happened that he and Mortensen tend to appear in games together, but he hasn’t really made much of an impact. And that’s probably because he can’t be trusted, so he doesn’t get that much playing time. He has a 7.04 ERA and a 1.43 WHIP and has pitched 15.1 innings. He’s given up twelve earned runs on eighteen hits. Let’s not forget that Aceves began the season abysmally, and we were all wondering how in the world we would be expected to continue the season with a closer like that. Well, we didn’t, because Aceves pulled it together and turned it around. And now his ERA is 4.33 and his WHIP is 1.19. I mean, that’s actually terrible for a closer, especially in light of what we’ve been used to in recent years, but it could have been a lot worse. Still, objectively speaking, we need him to be better. He’s pitched 43.2 innings and has given up twenty-one earned runs on thirty-eight hits. He also has four blown saves. It should come as no surprise to anyone that our team ERA of 4.22 is one of the worst in the Major Leagues. So is our strikeout total, our batting average against, our earned run total, and our loss total. Our pitching staff is absolutely terrible this year and must somehow be fixed. However, a distinction must be made between the rotation and the relief corps. The latter is performing much better than the former. On the one hand, we expect our relievers to ideally not allow any runs. On the other hand, this is baseball, and runs are allowed, and the relief corps can not be expected to constantly clean up the messes made by the starters. It drags the relief corps down when they give up runs that end up costing the team games because the offense doesn’t hit or score and the starters don’t limit the damage. There are those who say that Bobby V. is not effective here because the brass won’t let him be himself. There are those who say that Bobby V. is not effective here because the brass lets him be too much of himself. And there are those who say that Bobby V. is not the problem and that the team is the problem. Well, I’m not in the clubhouse or the front office, so I don’t know what goes on behind closed doors. But I do know that Bobby V. is in a class by himself. His managerial style is not one that Boston has had in a long time, certainly not in recent years. It is a style that our players and many of our new guys are not familiar with. It is a style that is not always the most adaptable and that probably expects more adaptation than it itself makes. And it is a style that takes some getting used to. This style affects his conduct both on and off the field; it affects how he makes strategic decisions before, during, and after games and it affects how he interacts with the players and the media. And based on what I have seen, based on the decisions that he has made and the things that he has said, I don’t think that that getting-used-to process is over. Let’s see. Andrew Bailey is still on the DL, Reddick is having a pretty good year, and Bard is not a starter. 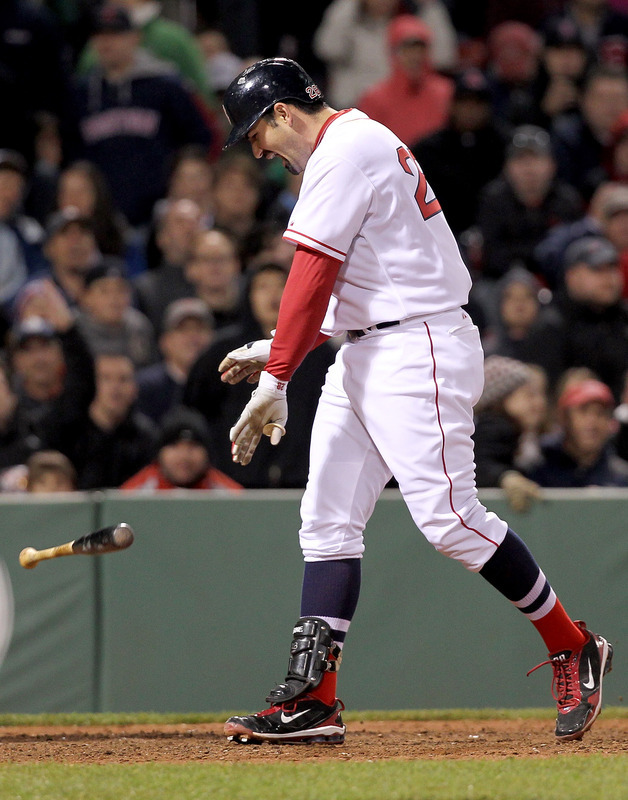 Whether the Youkilis trade was warranted remains to be seen. I trust Ben because Theo Epstein trained him and because in the past he’s shown that he has a very intelligent and strategic mind when it comes to sabermetrics and the ins and outs of being a good general manager for a team like ours. And he’s had only one off season and one half of a season so far at the helm, so the sample size is small. So I clearly will be giving him the benefit of the doubt. But I just hope that his long-term vision for the team is not compromised by any sort of impulse from anywhere to find quick fixes that may help us in the short run but will damage our future. I don’t really know what else to say. If I sound crushed and exasperated and frustrated, it’s because I am. And I think I speak for all of Red Sox Nation when I say that we all are. At the All-Star break, we’re at .500, tied for fourth (or last) place with Toronto and nine and a half games out of first place, which is where the Yanks are. We can’t win as a team, we can’t win consistently, we can’t score runs consistently, we can’t pitch well consistently. We can’t do much of anything consistently. We have all these problems and no solutions. We need to pull it together in an enormously huge way and have a truly phenomenal second half if we want to avoid the consequences of having a second half just like our first half. Oh, man. Oh, man, oh, man, oh, man. That was a terrible loss. It was absolutely crushing. Crushing, crushing, crushing. It doesn’t get much more devastating than that. To hold on and do everything right (I can say that because the only error we made did not result in damage, luckily; it wouldn’t have made a difference, as it turned out, all else being equal, but at least we can hold our heads high the way the score turned out) and play so well until the very last possible minute and then give it all up will bring the pain every time. The matchup was exceptionally even, but I don’t think anyone thought it would be going into it, which is a huge credit to the pitchers we sent out there. Morales was nothing short of stunning, both literally and figuratively. He pitched a full seven shutout innings. He gave up only three runs, walked two, and struck out seven. He threw 109 pitches, seventy of which were strikes. He threw a really nasty curveball as well as a nasty two-seam fastball, and his four-seam and changeup were also fantastic. He took advantage of his arsenal, mixing pitches well and varying speeds. He was efficient for the most part as well; he threw eleven pitches in the first, nine in the second, twenty in the third, nineteen in the fourth, eighteen in the fifth, thirteen in the sixth, and nineteen in the seventh. The first and second were his only one-two-three innings. He gave up his first walk in the third and his second in the fifth. He gave up a single in the fourth, sixth, and seventh, his only inning in which he had to deal with more than one baserunner thanks to a missed catch by Gonzalez, which put runners at the corners with two out. Miller had himself a one-two-three eighth inning. It was Atchison who took the loss for giving up the walkoff RBI single that ended it all. He began the inning with a flyout but followed it with a double and then an intentional walk. And then John Jaso pinch-hit for Miguel Olivo and singled on the first pitch of the at-bat to right field, scoring one run to win the game. If that had been all, the loss would have been crushing but not so devastating because we would have known that we tried our best and it simply wasn’t enough that day against the Mariners. But it doesn’t end there. Ross threw to the plate to try to get the runner, and Salty had it and was ready to tag and go into extra innings. He was ready. He had the ball and he was in position and everything with ample time and distance to spare. There wasn’t even a doubt that no run would score. And if the play had gone according to plan, who knows? Maybe we’d still be out there playing baseball. But no. As Salty tried to make the tag, he lost the ball. I saw it with my own eyes, and even as it was happening, I couldn’t even believe it. I didn’t want to believe it. It was one of the more pathetic things I’ve ever seen; Salty didn’t even know he lost the ball until after he applied the tag and saw that the run had scored. Only then did he notice that the ball was lying several feet from the plate. Meanwhile, the offense was completely and totally stymied by Felix Hernandez, who pitched a complete game shutout and held us to five hits and one walk. We struck out thirteen times, which tied a career high for Hernandez. We went down in order in the first, second, fifth, sixth, and eighth. We singled in the third, fourth, seventh, and ninth. Our best opportunities to score were the two innings in which we somehow managed to put two runners on the basepaths: the third, when we had two on with two out thanks to two singles which were for naught when Pedroia ended the threat by hitting a ball too hard to left center field, and the ninth, when we had two on with one out thanks to a single followed by our one walk, which went to Salty. And then Gonzalez stepped up to the plate and was quickly 3-0. The situation looked good. Then, all of a sudden, he swung through a fastball and then fouled off four straight pitches. So the count was full, and all of Red Sox Nation was hanging on the edge of their seats. And of course it ended very anticlimactically: with a flyout on the ninth pitch of a valiant at-bat. And you can thank the spaciousness of the outfield at Safeco for that. So the final score was indeed 1-0, and it was the most intense pitcher’s duel I’ve seen in a very, very long time. I mean, it was a real, old-fashioned pitcher’s duel. It had to be when the final score is 1-0. But it didn’t have to end the way it did. Even if we would have lost eventually anyway, it didn’t have to be decided by something so humiliating as simply having lost the ball. It was actually literally just horrifying. Yet again, we lost. Yet again, it was crushing. Yet again, the whole thing could have been neatly avoided. Lester lasted only five innings. He gave up four runs on six hits, but only one of those runs was earned, if you can believe it. He walked one and struck out three using a total of 108 pitches, sixty-nine of which were strikes. The Royals jumped out early; Lester began with a groundout and a strikeout but then allowed a walk that clearly should have been a strikeout as well as a single. Byrd then made a fielding error that by itself allowed the three unearned runs: it caused Johnny Giavotella to reach, Jeff Francoeur to advance to third, Billy Butler to score, and then Francoeur and Giavotella to both score on a double by Brayan Pena. Byrd dropped the ball, both literally and figuratively. I’m serious. That was the fielding error. He just dropped it. And Pena’s double was no less strange; it was in Ross’s glove, then as his momentum carried him back it got out of the glove and bounced against the wall, and then somehow got back into his glove without hitting the ground. Words can not adequately express the frustration and humiliation that befell Red Sox Nation at the hands of Ross’s glove, or rather lack thereof. Although our hitters didn’t make much of a splash in the first two innings, we answered Kansas City’s challenge in the third and tied it up. Byrd, perhaps in an attempt to make up for his egregious mistake, began the inning with a single. Sweeney then singled and, after Aviles flied out, Pedroia singled to load the bases. Papi of all people then struck out of all things, but Gonzalez, continuing his journey out of his slump, smacked a bases-clearing double. With one swing of the bat, the slate was clean once again. We looked like we may have been poised to score more in the top of the fourth; Ross began it with a groundout, but then Salty doubled and Byrd got hit. Two outs later, Kansas City was up at bat, and a double and sac bunt later, the winning run had scored. So Lester wasn’t as mediocre as his line would make him out to be, although he obviously wasn’t throwing his best stuff since he needed more than a hundred pitches to get through only five innings. Still, he did seem to settle down as the game went on. He retired the side in the fifth and was replaced by Mortensen in the sixth, when Mortensen did the same. The only other time we came close to threatening was in the top of the ninth, when Ross, then replaced by pinch-runner McDonald, singled and Salty walked. Both advanced a base on Byrd’s sac fly, which Bobby V. thought should have been ruled differently because he said that Byrd was hit on the finger. He wanted home plate umpire Jeff Nelson to ask the opinion of first base umpire Tim Tschida. Nelson refused on the grounds that Tschida would have been too far away to have an opinion at all. And then Bobby V. went off about it after the game because Sweeney and Aviles provided two quick outs, and you never know what would have happened had the inning not been over. Aviles had the team’s only multi-hit game with two hits. Gonzalez’s double and Salty’s double were the only extra-base hits we hit all night. Our batters didn’t pick up Ross’s slack, so we lost, 4-3. Yup. Ross dropped the ball. You know it’s getting out of hand when the only thing tempering your frustration is your retrospective lack of surprise. Last but most certainly not least, the condolences of Red Sox Nation and I go out to the family of Carl Beane, the voice of Fenway Park since 2003, who passed away yesterday. His last game was the seventeen-inning loss. He loved this park and this team, and he and his voice will most certainly be missed. What is wrong with us? It can’t be possible that opposing pitchers are having some sort of string of good days. It just can’t be possible. It has to be against all the laws of nature. Think about it. How is it that opposing pitchers, different guys, all just happen to be doing really well? It’s not possible. But the alternative conclusion is perhaps more disturbing: if it’s not the opposing pitchers who are having really good days, then it must be our hitters who are having really bad days. And I think I speak for all of Red Sox Nation when I say that I don’t think that makes anyone feel better about the situation. Every time we turn a corner so far this year, it seems like we then drop the ball and end up right back where we started. When are we finally going to get on the right track? Bard gave up four runs on eight hits in five and one-third innings; he walked two, struck out one, and took the loss. He threw 101 pitches, sixty of which were strikes. And yet again, one of our pitchers gave up all but one of his runs in the inning he left the game. He had a one-two-three first, gave up one of his two walks in the second to face one over the minimum, did the same thing in the third, and gave up his first run in the fourth on a double followed by an RBI single. And then he had a one-two-three fifth before letting us down in the sixth. Josh Reddick of all people figured in the disappointment yet again; he led off the inning with a single. After a flyout, Bard gave up two consecutive doubles, which accounted for two runs. Then he hit a batter and gave up another double for his fourth and final run allowed. No command. No control. No efficiency. No rhythm whatsoever. That’s really all there was to say about it. Of course, it takes two to tango, and we’ve overcome so much worse than a four-run deficit over the years that you may not have even been concerned about it. Until you realized that it was the bottom of the seventh and we’d failed to score. After two one-two-three innings and two innings of two baserunners on and two innings of one above the minimum, Salty led off the seventh with a single. Will Middlebrooks, who was called up because Youk – surprise, surprise – was finally placed on the DL with a low back strain, followed that with a double. Salty scored on a flyout by Byrd. One batter later, we worked two consecutive walks to load the bases for Gonzalez, the man who is so due it’s not even funny. With one swing of the bat, we could have brought ourselves within a run. But Gonzalez had other ideas. He struck out instead. Papi led off the eighth with a double, but we did nothing with it. 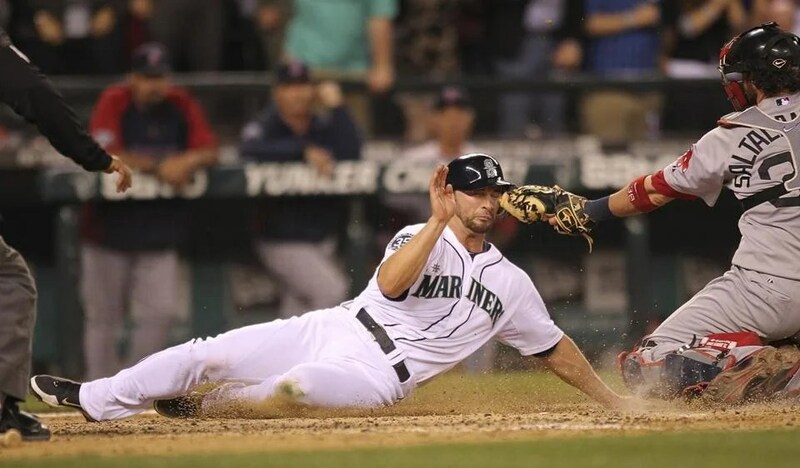 In the ninth, Aviles singled and scored on a double by Pedroia. And that was it. That was all we could muster. We lost 4-2. So, yet again, it didn’t matter that the relief combination of Albers and Mortensen delivered completely. We had only two multi-hit performances of two hits each, one for Papi and one for Middlebrooks, who also stole a base. At least someone was having a night to celebrate. Five of our eight hits were for extra bases, all of them doubles, and two of them Papi’s two hits. To say the least, it was extremely frustrating.